Here are the top Spas & Salons in Las Vegas that do their social media in style. We've also provided a brief summary of our take on what they do, that's different - beyond the regular special offers and greetings on Bad Hair Day. Want to know more about local businesses rocking social media in your own neighborhood? The Free EyesAndFeet application has the details. PS: we haven't included the big chains (Supercuts, GreatClips, etc) in this list - it just wouldn't be fair. One glitch though we that we noticed in some of their posts is that, they just give the links and don't say anything about it. This may not be a nice idea on twitter! engage with your customers. Although in twitter numbers, 39 seems like a small number we feel that this salon will grow fast! 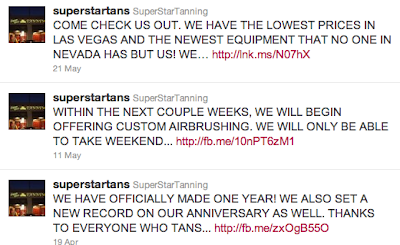 With a steady flow of specials, offers & replies this Las Vegas Super Star tanning salon is the top individual Spa & Salon on twitter. 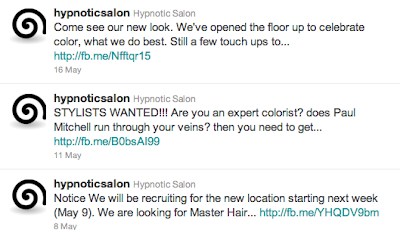 Like Hypnotic Salon, many of their posts springboard off Facebook.